The South Carolina Core Repository holds drill core and cuttings collected throughout South Carolina. The collection acts as a rock "library" and is available to individual researchers and industry for geologic study. The purpose of the collection is to compliment mineral exploration and wiser use of South Carolinas natural resources. Over 1,200 drill holes of core are stored in the repository. The core inventory consists primarily of rock core drilled during mineral exploration on private and federal mineral leases. 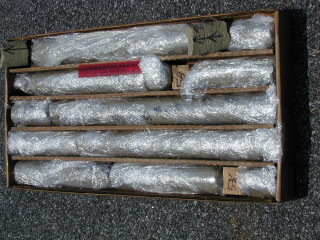 Also included in the collection are Coastal Plain drill cores and a small number of rock cuttings, chips, and samples. Most cores are classified as non-confidential and are open-filed for viewing. The repository is 4,000 square feet and is used for both storage and core examination. The facility provides table space and examination equipment, which includes a binocular microscope and trim saws. The user is responsible for laying out the core and returning it to the pallet when finished. Staff provides retrieval, replacement, and slabbing of material. The facility is open Monday through Friday 8:30 am to 4:00 pm EST. It is requested that the user call Joseph Koch at (803) 896-4167 in advance. Advanced notice is necessary because table space is limited. It also insures the availability of the requested core and samples. Currently, there are no user fees. Visitors are to use extreme care when handling drill core so that the sequence of the core boxes is not disturbed. In order to maintain an accurate record of the core for future use, every effort is to be made to replace the core exactly as it was found in the core box. Depending on the condition of the core and with prior approval from the State Geologist, some limited sampling of materials is allowed. No sampling of core will be allowed where 1/4 or less of the full core diameter exists. No more sample than is reasonably needed is to be removed. Restricted sampling is necessary to preserve the core as much as possible. Theft of core will be considered a criminal offense and punishable pursuant to the laws of South Carolina. After testing, any remaining sample pieces, cuttings, or pulps should be returned to the Survey with proper labeling. The user must complete a form listing all samples removed. Also, any core sample removed from the box must be replaced with a marker showing the date and footage of core removed. Thin sections or other data should be returned to the Geological Survey upon completion of the study or upon request. The Survey should receive a copy of all research results, data, reports, publications, interpretations, assays, and logs from the examination of the core. This information will become part of the public record. Many core holes have lithologic descriptions (logs) that have been placed on open file. However, there may be some core with available logs that are confidential. It may be possible to view the confidential core and obtain copies of the logs by contacting the company that provided the core and logs. It is the responsibility of the user to obtain written permission to view the core and have the lithologic logs released. Verification may be required by the Geological Survey. University students who remove samples for use in reports, research or theses must fill out the previously described form. Students and their major professors must take responsibility to return sampled materials. The Survey should receive a copy of all research results.